This post is the first in a new series I call Screw Advertising. These posts are especially for entrepreneurs with service businesses. Service marketing is different from product marketing – you know that, and I know that (hell, I run a service business myself.) Ad campaigns are for razors and ketchup, not huge decisions like the ones your clients make to ensure their business success. This series spotlights the unique service marketing space. Your clients want something from you, but it’s not your product or service. Some of you reading this are uncomfortable with that statement. Our egos want our clients to be devoted to our amazing, revolutionary widgets and systems. If you’re struggling with this, try to remember the last time you felt deep respect and trust for the firewall on your computer or the piece of machinery you use every day. I’m going to take a guess here and say you haven’t ever felt that – if you have those feelings at all they’re directed at the team who runs your IT or the person who sells and maintains your equipment. Why should it be different for your clients? In all my years in this business, I’ve never had a client say: “Man, we love marketing!” But I have had them say: “Man, we love working with you!” And that’s what I want. Who cares if they love marketing? That’s my job. As business owners, we get caught up in the brass tacks. We say things like “sure, I can make you a brochure!” or “we’ll hook up that database to the froofenglom” (I know lots about IT, obviously.) Those things are largely meaningless to your clients. People respond best to a solved pain, not a list of things you do. So make sure in every interaction you highlight what you’re solving, not what you’re doing. “You’re going to look really professional in your sales presentations” has way more weight than making a brochure. “Your computers will run faster and your employees will stop wandering off to make coffee while they load” is tangible value. Ask them what they think. Clients appreciate being asked what’s up every now and again. If you carve out some extra space, independent of your ongoing projects and daily concerns, just to ask them what they value about your relationship and what’s causing them pain right now, you will be leagues ahead of 99% of your competitors. Your clients will love it, and you’ll get golden information. Perfect their ideal client service experience. You have an idea in your head of what great client service is. I know I do! But from years of experience contrasting what business owners think is great client service, and what their clients think is great, I can tell you there are always differences. I’m not saying your client service is bad. It just might not be optimized for your client. Maybe you provide something, like super fast shipping, that clients don’t value as much as you think. Maybe a tiny adjustment would take their experience from great to remarkable. Focus your energy around creating your client’s actual ideal world instead of what you assume is their ideal. Even our best assumptions are just assumptions. Be everywhere in your industry and the industries you target for your clientele. Show your knowledge in the hot topics facing your clients today. If you’re stuck on topics, a great template for this type of thought leadership is “How can (industry I serve) use (thing I am an expert in) to solve (burning industry problem)?” Going back to the IT example, a great topic would be how clients can use technology to become more efficient and save money during an economic downturn. Find places to speak about your topic where your clients and their colleagues will see you. Share a white paper you wrote with them. Offer a lunchtime webinar or live event to share your expertise and take questions. Not only will you confirm your clients’ good opinion of your expertise, you’ll probably pick up some new clients along the way. Click here for a downloadable guide to exactly the kind of thought leadership I’m talking about. Connect with people they trust. Have you ever heard the quote “80% of success is just showing up”? It counts for creating deep client relationships too. What associations and communities do your clients belong to? Make sure you have a presence there, and you’re actively networking with those groups. People, especially business people, don’t make decisions in a vacuum. Surround yourself with the people, publications and associations that your client trusts. If your clients’ influencers think you’re great, your client will value you all the more. 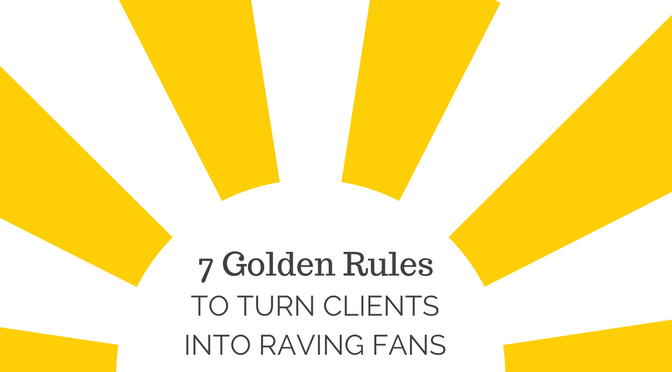 This golden service rule makes you indispensable to your clients. Use your community connections to open doors for them! Who do they want to do business with? Introduce them. Take them along to your next Chamber of Commerce event and focus on helping them network. This rule is about a service mindset. When you’re focused on how you can do more for your clients, they take notice. Suddenly you’re not just the IT guy anymore, you’re the person who introduced them to their next big prospect or took them to see their favourite speaker do their thing. Can you imagine what a raving fan you would be if one of your suppliers did this for you? I’d be so happy I would take out a freaking full page ad in the paper. And I titled this series Screw Advertising. That is how happy I would be, I would forget my own series title. An oldie, but an oh-so-goodie. We all need the reminder sometimes, when we’re stuck in the weeds, to deliver on our promise. Deadlines met, problems solved, but above all, pain alleviated. When you’re doing the work to communicate your true value, make sure you’re acting on it in a strategic way. What I mean by that is this: solve the real problem. I had a client once who did software solutions for businesses. One of their clients, a furniture wholesaler, asked them to serialize the demo chairs, because the sales guys would just chuck them in their trunk and no one could find them. P.S. Hey, want more details on the “Show your expertise” rule? I’ve created a quick and dirty guide to thought leadership to inspire you. Click the big button below and I’ll send it straight to your inbox. Click to download the FREE Show Your Expertise Worksheet!